Age doesn’t stop Morgan Wilson from doing anything, unless it’s driving. The Virginia Beach teenager doesn’t have that coveted license yet because she is only 15. But she does have a degree from Tidewater Community College. Wilson graduated from TCC on Dec. 19 with an Associate of Science in General Studies and a 4.0 GPA. 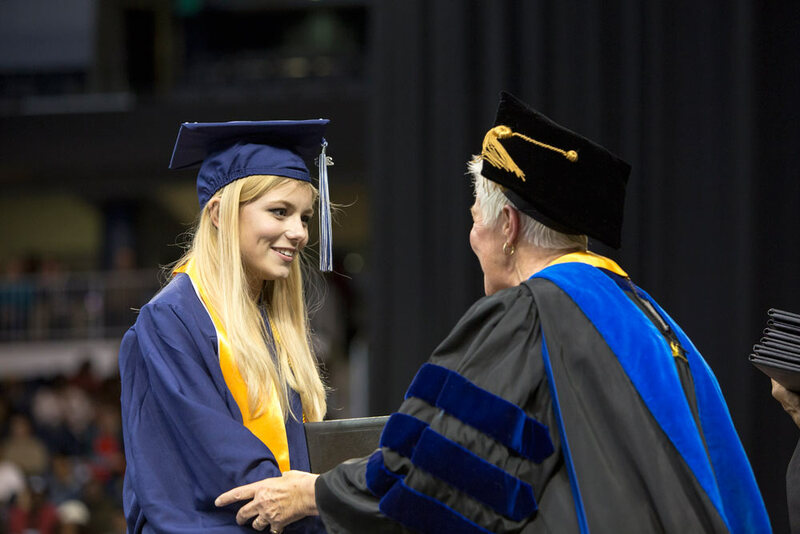 She is the college’s youngest-ever graduate. “This is very big for me,” Wilson said. “I’m so thankful I was able to come to TCC. TCC’s Michele Barnes, coordinator of student support services, easily recalls Wilson walking into her office as a 13-year-old, resume in tow. Home-schooled since fifth grade, Morgan is that kid who never had to be told to do her homework. She tackled the accelerated pace of her own schooling aggressively so she could finish all the requirements by age 12. Attending TCC was her idea, and after breezing through the placement tests, she was ready to take her first college classes. At her mother’s request, she started with just four: the one-credit student development class in addition to English, public speaking and physical education. After that it was full speed ahead for Wilson, who thrived, she said, with the help of numerous professors, particularly in math, admittedly not her strongest subject. She didn’t reveal her age in class, but it was never an issue. Wilson said she fit right in with TCC’s diverse student body. Her youth made her more cognizant of safety, but Wilson said she felt completely secure wandering campus and spending time in between classes at the Virginia Beach Student Center and the Joint-Use Library. “My favorite library in the entire city,” said Wilson, a Harry Potter diehard. She took classes online during the family’s brief move to Northern Virginia, making treks back every three weeks to complete a hybrid German class. Her professor, Paul Truesdell, was among her favorites, as is Barnes for helping her navigate the correct path. Wilson will enter Old Dominion University as a junior in the fall to work toward a degree in leadership. She’s not quite ready to answer the “what do you want to do with your life?” question, though Barnes offers this prediction. Given Wilson has an entire spring and summer until she starts at ODU, her plans include, what else? Taking more classes at TCC’s Virginia Beach Campus.